We are really looking forward to the Visual Activism Symposium put on by SFMOMA March 14-16 (Gemma and Eliza will be in attendance). We’d love to hear about any articles or resources people have that relate to that particular topic. We’ll post those here along with things we learn over the weekend. The participants in Sunday’s Bearing Witness event will include our collegue Pete Brook, editor of prisonphotography.org; Mike Krieger, co-founder, Instagram; Susan Meiselas, photographer, Magnum Photos; Margaret Olin, senior research scholar, Yale University; Doug Rickard, artist and founder of americansuburbx.com and theseamericans.com; Kathy Ryan, director of photography, The New York Times Magazine; and, Zoe Strauss, artist, Magnum Photos. 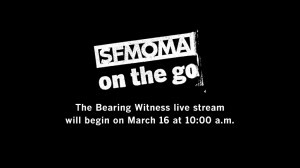 Bearing Witness will be streamed live. March 16, 10am PST. Tagged activism, art as activism, events, Pete Brook, San Francisco, SFMOMA, visual activism, visual activism symposium.